Here’s a modern day video game mystery we haven’t been able to solve: Why are the download files for new Assassin’s Creed Syndicate outfits so enormous? 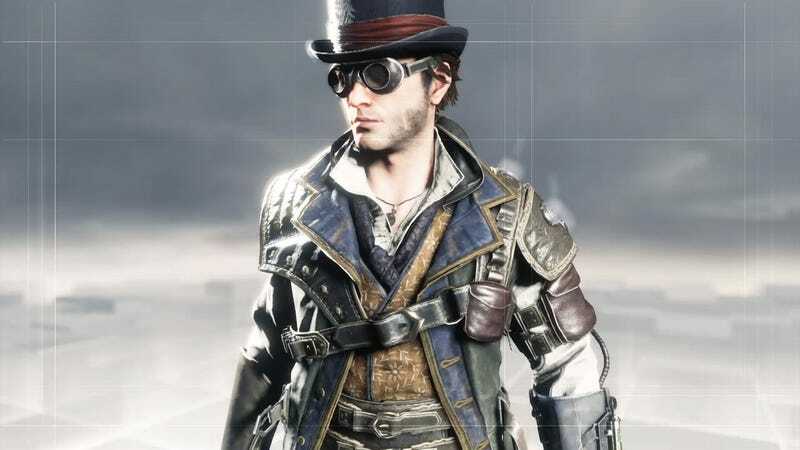 A new free download that gives players a single Steampunk outfit for Syndicate’s twin protagonist Evie Frye is an 820MB download on Xbox One. The PS4 lists it at 1GB. A $5 downloadable Steampunk Pack that gives players a new outfit for Jacob Frye as well as five pieces of gear like the ones pictured right below this paragraph is listed at 2.1GB on PS4, 1.5GB on Xbox One. The entirety of Assassin’s Creed Syndicate weighs in at 47GB on PS4. Neat as these outfits and pieces of gear are, it’s hard to believe they contain that much data. Sadly, we don’t know the reason for the size, as Ubisoft PR has not responded to a request for comment. Nor did the official Assassin’s Creed Twitter feed when I Tweeted at it yesterday. Some fans online have speculated that the downloads contain patches for the game, but these are optional downloads and it’s highly unlikely that any essential graphical or performance patches for the game would be sequestered to discretionary DLC. Perhaps AC Syndicate needed a big patch just to support the addition of the new costumes and that’s what we’re being asked to download here. This is an odd one, but fans will likely accept Assassin’s Creed idiosyncrasies such as this one rather than the kind fans were getting with last year’s main AC.